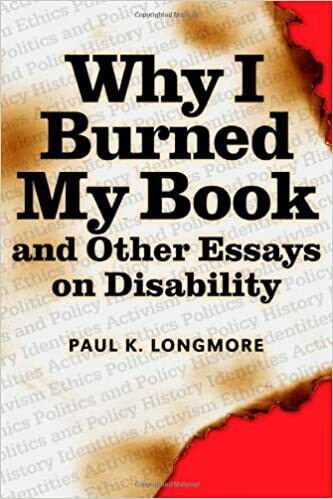 Why I Burned My Book and Other Essays on Disability, by Paul K. Longmore presents an overview of almost a century of disability issues and activism. ... Dr. Davidoff's "Foreword" asks why we still see disability as such a frightening subject, asserting that it challenges our beliefs about normality and our own vulnerability. Why I burned my book and other essays on disability. Responsibility: Paul K. Longmore. Imprint: Philadelphia : Temple University Press, 2003. Physical description: ix, 278 p. ; 24 cm. Series: American subjects.